I too, have known autumn too long. I’m not sure I agree with e. e. cummings. I’m not sure it’s possible to know autumn too long. On a physical and metaphorical level it’s a great time of year. Two things happened as I biked to and from the Chicago Architecture Foundation this week to underscore that fact. On Monday city crews began putting up the snow fences along Lake Shore Drive between Jackson Boulevard and Randolph Street. Today the bulldozer was busy at work north of the Oak Street beach, pushing up sand berms between the lake and the Outer Drive, a buffer against those nasty lake-effect snow squalls that are to come. They can make all the winter preparations they want . . . nothing can deny the beauty of this city autumn. That’s why I like the above photo so much. It has the contrast of seasons in it that is like so many of the contrasts we see in this great paradox of a city. 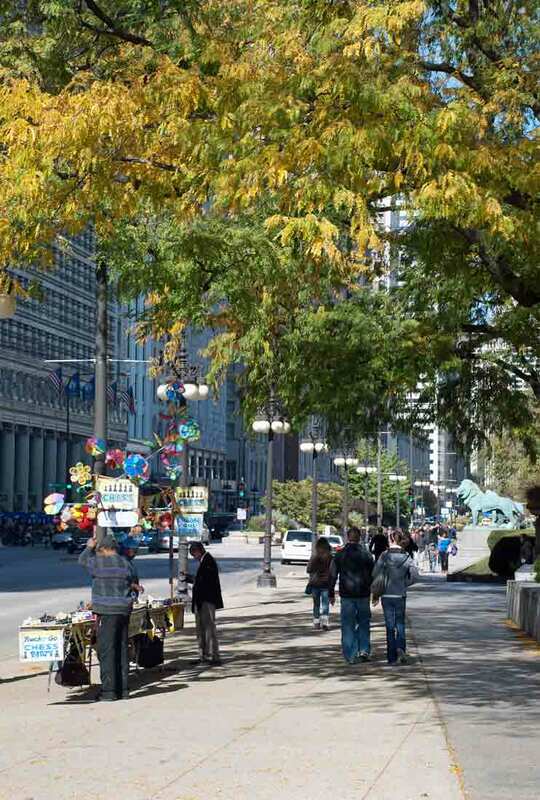 The lions at the Art Institute stand guard as the locust trees along Michigan Avenue change colors. Under the color-laden limbs, the chess-checker guys, summertime fixtures, set up shop once again, inviting folks to match wits as breezy seventies tunes play from the speakers behind the table holding the game boards. Soon they’ll be gone, too. For now, though, it all comes together . . . great weather, great scenery, a great city, all of it moving along toward a future we can’t avoid. The above writing was brilliant.